CBS Sports.com writer Mike Axisa caught wind of a post from Pinstripe Alley showing a tweet sent out by Jake Hernandez, a player in the Yankees organization. 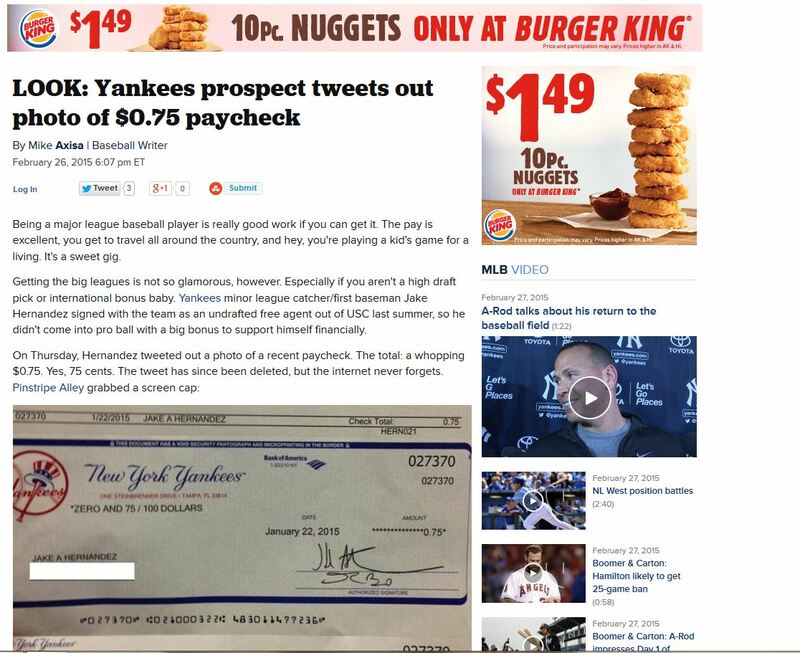 Hernandez, an undrafted senior from USC who signed with the Yankees put up a photo of a recent paycheck for the whopping total of .75. Speaking of whopping, (or Whoppers) the ad running on our screen from Burger King provides an ironic and hilarious juxtaposition. Yes, Jake, if you want a meal at BK, you’re going to need to go back to work and waif for the next payroll period. CoachDeck is proud to add Shuttle Baseball to its list of sponsors of the popular OnDeck Newsletter. Shuttle Baseball offers a fun and innovative new twist to the game that kids of all ages will enjoy. Check them out! If you didn’t have our latest issue of OnDeck delivered to your inbox, you can kill two birds with one stone by clicking here! Read the February editions with articles from Dan Gazaway, John Ellsworth, Adrian Parrish and more, and you can sign up to get all future OnDeck Newsletters via email, for free! Tomorrow we will be sending out our popular OnDeck Newsletter. You can get it delivered to your inbox as well by signing up for free here. Enjoy this month’s issue! Ask yourself this: Would you rather work at something or play it? I remember having a discussion several years back with a fellow Little League board member. The topic of the conversation was whether youth sports should be competitive. He said, “If you put a ball on the ground between people, there is going to be competition.” How basic, and how true. Yet the kids we coach aren’t competing as they naturally would, because we won’t let them! I walk by baseball practices. Fly balls being hit to kids who may or may not catch the ball, then may or may not make a good throw back in. There’s no one even to throw to. Just get it near the bucket. Ground balls being hit and fielded. No apparent object to the exercise except to work on fielding. I see soccer practices. Kids in line taking turns receiving passes and shooting on goal. No one remembers whether it went in or not the minute after it is kicked. Players dribble through cones and then get in line to go back the other way. I’m bored just writing about it. Think about how many times you’ve started a sentence with, “Let’s work on…,” or “We’re going to work on…” compared to how many times you’ve said, “We’re going to play…”. When you start a sentence with “We’re going to play…” watch all the kids look up from the ground with smiling faces and expectant looks in their eyes. Now you’ve got their attention! I can’t imagine running any of the above drills, or any others for that matter, without turning them into an exciting competition the kids will love. And if you’re wondering how, grab a CoachDeck because these drills and 50 others are in there and every one contains a unique, “Make it a game,” feature. Maybe it was because my siblings were all much older then I am so by the time I was in grade school I was essentially an only child. And there was no X-Box. I made up games for everything, even if I was alone, competing against myself. Even if you’re training one player you can make boring drills more fun simply by using a stopwatch and going for “record” times. Come on, coaches…get inventive! Let your kids do what they inherently want to do, which is compete against each other, play games – have fun! You’ll see better attendance at practices, and your kids will be more prepared for real games. And guess who else will have more fun at practice? You will. Getting the kids together at the field tonight? Don’t work on anything with them. It will be the best practice you’ve run all year. It’s been my experience, teaching many pitchers throughout the years, that velocity comes with maturity and when proper mechanics are incorporated in a pitcher’s delivery. Many coaches are concerned if their athlete is on the low end of the totem pole when it comes to hurling the heat. For good reason to, velocity is important, however, it’s very difficult to tell how much potential a pitcher truly has until after they mature if your only looking at velocity. There are so many other things to consider when rating a pitcher. As I was working with one of my students tonight who just turned 16 (I started working with him when he was 12) I remembered him battling with velocity until he was about 15. Throughout many of the lessons he would bring up how slow he threw, his father would often ask if his boy really had what it took to pitch. This pitcher is a late bloomer, but he stuck with it and it has paid off big time for him. Now he is throwing hard and his pitches are moving a lot more. I honestly think he wouldn’t be the pitcher he is today if he wouldn’t have been annoyed by how slow he was throwing. He is dedicated and has worked very hard to be where he is now. I still believe he will put on another 5 mph by the end of this year because its just that time for him and his mechanics are solid. Most of his momentum is going where it needs to go and there is hardly a wasted movement in his delivery. I’ve taught several pitchers like him that mature late. Many think they don’t have what it takes to be a pitcher because of velocity alone, but that simply isn’t the case during adolescent years. If you yourself aren’t throwing as hard as some of the other boys your age and you have a strong desire to pitch, stick with it. Keep working very hard on your mechanics, core strength training, speed and agility etc. and you may just surprise yourself and others later. Have you noticed that some kids that seem to have a natural ability to throw a baseball early on don’t seem to have the work ethic to make it far? Those that have weaknesses in sports, but have a burning desire to do whatever it takes to overcome it, seem to make it further than those that have it easy in their youth simply because they think they don’t have to work as hard. The fact is, those that put in the time and dedication are the ones that succeed the most. I recall I was one of the fastest pitchers in our little league from 10-12 years old; then a crazy thing happened, it seemed like I couldn’t throw hard anymore. All of the other pitchers in my grade were throwing hard and I couldn’t; it didn’t help that I was 6 months younger than everyone. But what happened? I turned into one of the slowest, if not the very slowest pitcher from about 13-15 years old. I remember hearing in the dugouts “man this kid throws slow”; then I would strike them out or they would hit a slow roller. Luckily I had an awesome coach and great pitching coaches who believed in me and kept me pitching most every game. Later on, within 6 months to a year, I became one of the fastest pitchers again. Stick to proper mechanics, keep a solid work ethic and believe in yourself and you’ll always know you gave it your all with no regrets. That work ethic will follow you wherever you go in life. Dan Gazaway is Owner and Founder of The Pitching Academy (www.thepitchingacademy.net). He has instructed over 2,000 pitchers in the last seven years and received a Bachelor’s Degree as a Health Education Specialist at Utah State University. He is a motivational speaker for topics ranging from attitude, goal-setting and leadership and be contacted at contact@thepitchingacademy.net.